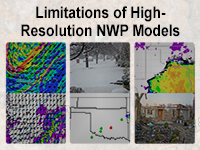 This scenario-based lesson examines how the limitations of high-resolution NWP forecasts affect their analyses and forecasts of winter and severe weather, and how best to use the output in light of the limitations. The lesson is structured around a case that occurred in Texas in December 2015 when winter weather and severe weather hit Amarillo and Dallas-Ft. Worth, respectively. As users go through the case, they learn how spin-up time, errors in initial conditions, and deficiencies in the modeling of mesoscale phenomena can impact high-resolution forecasts in the NAM nest and HRRR models. There isn't too much that most forecasters don't already know. Maybe have another case study in addition to this one in a different part of the country. Excellent review. Would be nice to replace tabs with a grid of images to compare different model runs.